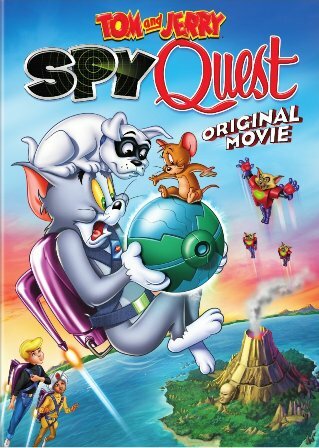 Don’t miss the chance to win your own copy of Tom and Jerry: Spy Quest on DVD, enter our giveaway! 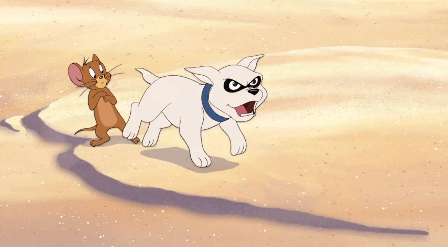 Hot on the heels of the excellent Tom and Jerry: The Gene Deitch Collection DVD (which compiled a baker’s dozen early-‘60s shorts directed by Deitch), Warner Bros. Home Entertainment has issued the all-new Tom and Jerry animated feature, Spy Quest. And this one is a strange mash-up, indeed. Speaking of the ‘60s, cult cartoon fave Jonny Quest teams up with the cat and mouse for a rather hectic 73-minute adventure. Hanna-Barbera Productions, which of course created Tom and Jerry, debuted the action-oriented sci-fi series Jonny Quest in 1964. The character underwent a couple of revivals over the years, but seems to have been pretty much dormant since the ‘90s. One such revival attempted to modernize the characters. For Spy Quest, the tone remains decidedly old school (including some unfortunate ethnic stereotyping carried over from the original series). 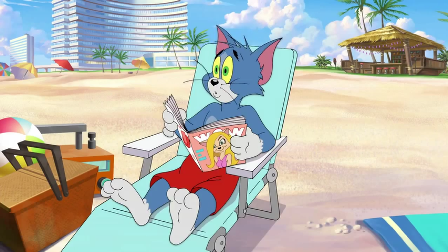 Tom and Jerry (more or less mute throughout, as they should be, save for some ill-advised screaming from Tom whenever someone gets the better of him) are messing about on a Florida beach when they cross paths with the Quest crew. Jonny (voiced here by Reese Hartwig), his dad Dr. Benton Quest (Eric Bauza), their right-hand man Race Bannon (Michael Hanks), Jonny’s best bud Hadji (Arnie Pantoja), Jezabel Jade (Tia Carrere), and Jonny’s dog Bandit are all battling the evil Dr. Zin (James Hong). Zin wants nothing more than to steal Dr. Quest’s newly created Q Sphere, basically a super-effective, massive scale power generator. So Zin deploys a battalion of dangerous cat soldiers to capture it from the Quests. It’s all as silly as it sounds, but it’s also frenetic enough to hold the interest of its target audience: kids. Adults with a nostalgic yearning for Jonny Quest will probably get a kick out of seeing the character revived after such a long dormancy (and, in a nice touch, original Jonny voice actor Tim Matheson drops in for a key cameo). 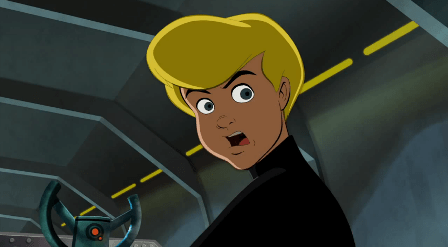 That said, Spy Quest is basically an excuse to make an all-new Jonny Quest feature. The grafting of Tom and Jerry onto this story feels forced. It’s as if someone at Warner realized that Quest alone may not be “relevant” enough to today’s viewers to justify the expense of producing a new film, so they decided to tack on the ever-popular cat and mouse duo to help rope in viewers. And it’ll probably work out well. But Tom (portrayed far too cowardly and buffoonish, by the way) and Jerry feel out of place, as if their presence was more of a jokey cameo that outstayed its welcome. And Jonny’s sidekick Hadji is an unwelcome remnant of a far less P.C. era (as is the ‘evil Asian’ caricature Dr. Zin). The tongue-in-cheek nature of the retro-styled production helps couch the stereotyping in parody (at least that’s what it feels like co-directors Spike Brandt and Tony Cervone were going for), but that subtle layer will likely be lost on younger viewers. Bonus features include episodes from the recent Warner Bros. series The Tom and Jerry Show and vintage episodes from Jonny Quest and The New Adventures of Jonny Quest.